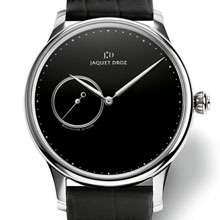 Their magic world has always fascinated Jaquet Droz. Of the stones used by the Manufacture’s expert dial-makers, onyx is particularly admired. Alluring and mysterious, it presents the shade of darkest night: the color of all our dreams, of all infinities. This poetic illusion is magically captured by Jaquet Droz in the Grand Heure Minute Onyx which, for the first time, confronts the dark mystery of onyx with the bright gleam of steel. It is an original composition for the Manufacture which, more than ever, is devoted to exploring new areas and conceiving new alliances based on the models that have made it legendary. With the Grande Heure Minute Onyx, Jaquet Droz extends the limits of creativity even further while preserving this wristwatch’s essential aesthetics. The minutes counter, off-centered at 9 o’clock suggests a telescope exploring the immensity of the sky, inviting us to search the unfathomable mystery of Black and plunge into its infinite poetry. 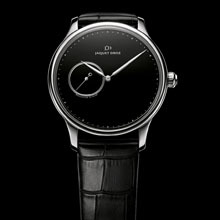 Movement :"Jaquet Droz 1169, self-winding mechanical movement, double barrel, heavy metal oscillating weight"